Many years ago (during the 1970's) when paper mill (located on the East side of city) was owned by MacMillan Bloedel Limited, they operated 2 barges delivering newsprint (paper in reels) to various ports along the U.S. eastern seaboard (From Boston to Miami). When mill changed ownership (early '80's) this type of transportation service was phased out and eventually discontinued altogether. In their original design the barges were enclosed from bow to stern. The barge in subject photo was modified at some point in time (rear portion of enclosed deck removed). 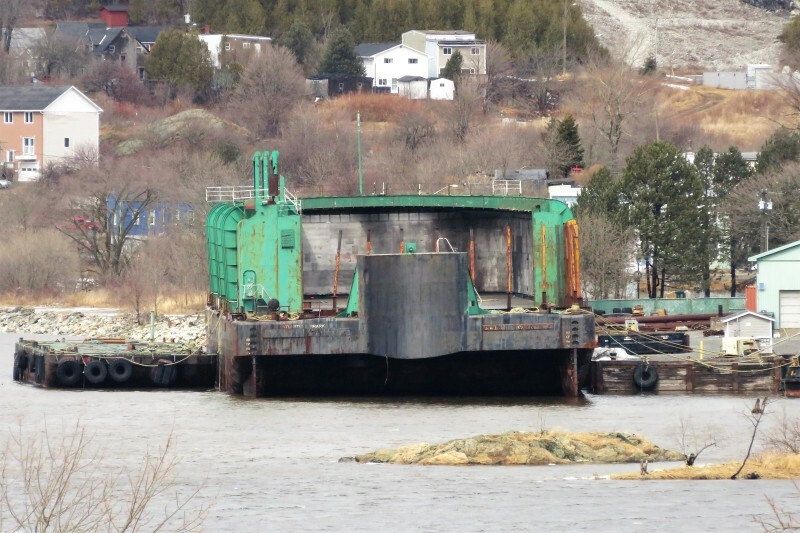 In their prime barges were named ROTHESAY CARRIER and SAINT JOHN CARRIER. (The latter depicted in photo). Their newsprint carrying capacity was approx. 7,200 short tons (6,530 MT). According to internet sources, sister barge ROTHESAY CARRIER (IMO7052143) now operating out of Charleston, S.C. Owned by Crimson Shipping-Chickasaw-AL (USA). Other photos (2) on this site under name KENT TRANSPORT and BARGE TRANSPORT.